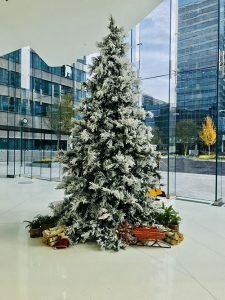 Foliage Design Systems Atlanta can help ensure all of your customers and employees are in the holiday spirit this year with holiday decor that will brighten up any space. Whether you want to put up office Christmas trees or install other Christmas decorations, such as wreaths and festive garland, we have a wide assortment of holiday decorations that will surely do the trick. When you call on Foliage Design Systems Atlanta for assistance with your holiday decor, we will walk you though the process, show examples of previous work and highlight some of the decorations we have in stock. We know that running a business is very time-consuming, and you certainly have better things to worry about than holiday décor. That’s why we invite you to be as much or as little involved as possible. Put your trust in us and allow us to take the reins in transforming your office into a true winter wonderland. For more than 35 years now, Foliage Design Systems Atlanta has been providing interior landscaping for businesses and commercial property managers. We have the experience it takes to help you pick out the right holiday decor for your space, and we know that you, your customers, and your employees will get right into the spirit once your new office Christmas trees and holiday decorations are up. There is nothing quite like the holidays, and you should use this time as an opportunity to inject some much-needed energy into your space with office holiday decorations. Let Foliage Design Systems Atlanta take care of everything. For more information on the holiday decor available through Foliage Design Systems Atlanta, call us at 770-451-0885 today.